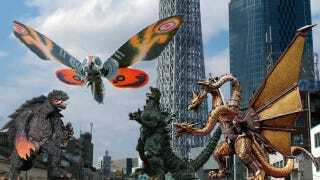 In Japanese kaiju movies (or giant robot anime), Tokyo becomes a stomping ground for larger than life characters. Cars are crumpled under their feet. Buildings are smushed during falls. And in the distance, Tokyo Tower is usually visible. But now a new tower, the Tokyo Skytree, towers over the Tokyo Tower. Opened yesterday, the Tokyo Skytree measures 2,080 feet and is the tallest tower in the country. Tokyo Skytree hasn't only altered the Tokyo skyline, but pretty much ruined every single monster movie from here on out. Godzilla doesn't look so big standing next to Skytree. Hell, no one does. Check out the comparisons by Twitter user Ei Ishii/T Yahashi.